Treasurer Tim Cahill’s been enjoying basking in the spotlight now that he’s apparently the anti-health care reform candidate. And that’s all well and good, but he can’t escape the fact that his fundraising has been unethical and now illegal! In case you missed it, yesterday the Tim for Governor Campaign sent around an email blast to state email accounts soliciting money for his campaign. You would think with all the bad press Cahill has been receiving, he would be extra careful not to make careless mistakes. If he’s this careless with his fundraising, imagine what he’d be like in the corner office. To catch up on Cahill’s latest blunder, click here to read articles from State House News Service, the Boston Herald and the Boston Globe. BOSTON—House Minority Leader Bradley H. Jones, Jr. issued the following statement after hearing Massachusetts was passed up for Race to the Top funds. While I am disappointed by the Race to the Top announcement, I am even more surprised that Massachusetts ranked so low on the list of eligible states. In addition to passing a reform package, we were all led to believe that Governor Patrick’s close relationship with President Obama certainly would have helped secure at least a better ranking than 13 out of 16. Massachusetts has always been among the leaders in national education, while consistently setting high standards. Governor Patrick expected us to jump through hoops and was very critical of the Legislature for not finishing this issue last fall. It appears that the Patrick-Murray Administration, despite the extra time, was unable to put together a strong and compelling application. Republican lawmakers in the House are pleased to announce a critical Republican initiative was adopted during today’s supplemental budget debate. The proposal which was offered as an amendment on the House floor today will appropriate $7.2 million to reimburse cities and town for the costs related to the special election held earlier this year. Republicans in the House were surprised this appropriation wasn’t included in the House Ways and Means supplemental budget as the State Auditor had previously confirmed that the special election represents an unfunded mandate that must be covered by the state. The amendment was nearly adopted unanimously. All but one lawmaker voted in favor of the amendment. Representative Daniel Webster appeared on Broadside with Jim Braude last night to discuss the recent passage of the health care reform bill in Washington. The Pembroke Republican and Lieutenant Governor Tim Murray were Braude's guests last night. To watch the segment in its entirety, click here. This week, the Massachusetts House of Representatives is slated to take up a Supplemental Budget for Fiscal Year 2010. After reading over the contents of this bill, House Minority Leader Brad Jones and his Republican colleagues grew frustrated by one key provision missing –no money was allocated to cities and towns for reimbursement for special election costs. While Republican lawmakers believe this legislation may contain important provisions, they are disappointed that it does not contain an appropriation to reimburse our cities and town for the special election which took place on January 19th. We hope it’s not because Democrats are disappointed with the results! The Governor’s version of this budget, which he filed earlier this year, contained $7.2 million for our cities and towns, and the State Auditor has confirmed that the special election represents an unfunded mandate that must be covered by the state. Therefore, Republican lawmakers will be filing an amendment that will provide the millions of dollars in reimbursements for the Commonwealth’s communities. The Republican caucus is optimistic that their amendment will garner bipartisan support. To do your part, call your legislator and ask him or her to sign on to this amendment. Tell him or her, your city or town deserves better! In case you missed it, last week, the Patrick Administration announced an additional $300 million budget gap. So, how does Governor Patrick respond to the devastating news? A fundraising trip to California! By raising taxes and fees, the decisions of Governor Patrick and Lieutenant Governor Murray have actually led to a worsened economy and an even less friendly business climate. As the economic outlook declined in Massachusetts, the Patrick-Murray Administration continued to push our state’s finances to the back burner. Is this leadership we can believe in? Meanwhile, as the state travels deeper into this fiscal crisis, our no-show Governor Patrick travels 3,000 miles to raise campaign dollars. While it is probably better that he is out of town, where he can do no harm, the people of Massachusetts deserve better leadership. Governor Patrick talks a big game but rarely follows through on his promises. During his State of the Commonwealth address, he claimed to have signed three budgets that were responsible, balanced and on time. It seems the Governor has a selective memory. After all, who cares if the budgets are on time if they’re not responsible or balanced? Governor Patrick and Lieutenant Governor Murray have been walking, talking disasters. Governor Patrick, you may be out, but your shortcomings are not out of mind. Exactly two weeks ago, the Ranking Republican on the House Ways & Means Committee - Rep. Vinny deMacedo – asked Administration and Finance Secretary Jay Gonzalez whether or not the Commonwealth could finish out the last four months of the fiscal year without tapping the Rainy Day Fund. The Secretary’s response was affirmative. Barring any tax revenue downturns within the next four months, the state would end FY2010 in good standing. The Administration was so confident in its assessment on March 5th, that it recommended $80M of overpaid Medicaid money be deposited into the Rainy Day Fund in order to help shore up the state’s depleted reserves. This happened just as the state partially crawled out from under a $600 million gap the Administration identified in October. Now only 14 days later, the Administration announces a $300M spending exposure related mostly to Medicaid. The Administration is now suggesting we may have to endure further cuts. This is simply another example of how the Patrick Administration – despite being handed billions of dollars in federal bailout money and raiding 75% of reserves – cannot competently manage this fiscal crisis. After downwardly revising tax revenue projections in October due to a $600 million gap, the Patrick Administration increased its projections only three months later in January. The revenue projection was raised by $181 million, and $43 million of October 9C cuts were restored. Clearly, the Administration just cannot get it right. In January, House Minority Leader Brad Jones criticized the Governor for hastily boosting projections so soon after enduring the worst fiscal crisis since the Great Depression. Recovery will undoubtedly be slow. It is only prudent to proceed with caution. Ignoring our advice, the Administration has now put us in a situation which could have been avoided. The time has come to hand the keys to the store to someone else. As you know, this past Wednesday was Evacuation Day and while the State House was much like a ghost town, Republican lawmakers and their staffs were hard at work. Republican leadership in the House and Senate held a joint caucus, where they invited Michael Widmer of Massachusetts Taxpayers Foundation and Bill Vernon of the National Federation of Independent Business to discuss jobs and the economy. The caucus also invited members of the media to attend. Today, the Boston Globe applauded Republican efforts for working on Evacuation Day and for sending an important message to Democrats on Beacon Hill. Today, Republican lawmakers offered a local aid resolution at the first full formal session held in several weeks. Not surprisingly, the resolution was not even allowed to be introduced and debated on the floor. Also not surprising is the hypocrisy shown by Democratic leadership. We’ve adopted local aid resolutions several times in the past – the last time was when now Speaker Bob DeLeo was Ways and Means Chairman. It also clearly shows the difference in priorities between House Republicans and Democrats. GOP lawmakers want to protect communities and local services while the Democrats want to slash local aid. b. The minimum Unrestricted Local Aid appropriation must equal $936,437,803. This resolution provides among other things flexibility during budget debate, so that the Legislature might further increase local aid appropriations from an established floor. It also provides predictability for municipalities who are already constructing their budgets. "Continuing the Legislature’s commitment to supporting core services at the municipal level through state-funded local aid payments, Steven Panagiotakos, Chairman of the Senate Committee on Ways and Means, and Charles Murphy, Chairman of the House Committee on Ways and Means, announced today an agreement on levels of support cities and towns can expect in the upcoming fiscal year. According to the agreement, municipalities will receive no more than a 4% cut in their Section 3 local aid in the upcoming fiscal year and all school districts can count on being funded at their foundation level of support." Helpful? No. Informative? Absolutely not! Supporting our communities and local services during the terrible times? Yeah right! If anything, this press release, ummm – plan makes it even more difficult for municipalities to start the budget process. It is vague, difficult to interpret and quite frankly insulting to our local officials. The only thing it clearly shows is the Democratic leadership is looking to make cities and towns pay for their years of fiscal irresponsibility. Republican leaders in the House and Senate held a joint caucus today to discuss the state of our economy, jobs and the business climate in Massachusetts. Special guests included Bill Vernon of the National Federation of Independent Business and Michael Widmer of Massachusetts Taxpayers Foundation. Minority Leaders Brad Jones and Richard Tisei also invited members of the press to the event and many media outlets were represented. Click here to watch video shot at the event by State House News Service. 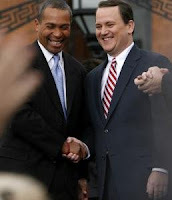 Governor Deval Patrick and his sidekick Tim Murray should probably give up the whole “common man” act. Patrick and Murray seem to be having a field day attacking their Republican rival but what they both seem to be forgetting is that Deval Patrick benefited from the success of a very large corporation. After doing a little research, The Capitol View stumbled upon the employment agreement between Coca-Cola and Deval Patrick from 2001. Governor Patrick and attack dog Tim’s attacks on Charlie Baker have been hypocritical to say the least. According to the contract Deval Patrick actually made a comparable salary to his chief gubernatorial rival while serving as an executive to Coca-Cola. Governor Patrick and Lieutenant Governor Murray have had no problem going after Baker’s salary, saying his pay increase came on the backs of health insurance recipients. But, what about Deval Patrick? Isn’t this the same governor who wants to tax soda because of its contribution to childhood obesity? So, would it be fair to say, Deval Patrick got richer as our country’s children got fatter???? Now, that is something to think about. With the state unemployment rate at 9.5 percent – the highest it’s been in 34 years –and more than 320,000 Massachusetts residents out of work, House and Senate Republican leaders plan to meet at the State House on Evacuation Day (March 17) to discuss jobs and the economy with a leading local economist and respected small business advocate. At 11 a.m. tomorrow, GOP leaders will be meeting with Massachusetts Taxpayers Foundation President Michael Widmer and National Federation of Independent Business-Massachusetts State Director Bill Vernon in the office of Senate Minority Leader Richard R. Tisei. The meeting will focus on the state’s economic outlook and strategies for getting Massachusetts residents back to work. Immediately following the hour-long meeting, there will be an open caucus. At that time, members of the House and Senate Republican leadership teams will be available to answer questions from the press. The health care debate continues to monopolize Capitol Hill and many would have you believe that the health care reform passed in Massachusetts under former Governor Mitt Romney is identical to what President Barack Obama is proposing. The fact of the matter is – this assertion is simply false. As you may know, 98% of Massachusetts’ population is currently insured. This was accomplished through a plan that did not include new taxes, no mandates and certainly no public option. One thing the Romney bill had that President Obama’s does not is bipartisanship. When health care reform passed here in Massachusetts, the plan was within budget projections. However, since Deval Patrick was elected, he has mandated expanded benefits and exempted some groups of people from paying anything at all! Click here to read an interesting piece from Politico about the comparison by Cesar Conda. BOSTON—House Minority Leader Bradley H. Jones, Jr. issued the following statement today after House and Senate budget writers announced cities and towns can expect local aid to be cut by up to, but no more than four percent. This local aid announcement is indicative of the Democratic Leadership on Beacon Hill, disappointing but not surprising. Over a week ago, the Republican Caucus announced its intention to offer a local aid resolution. When we distributed our resolution, we offered a clear and concise proposal that laid out our plan point by point. Any municipality reading our resolution would be able to understand exactly how it would be affected under our plan. That is why nearly 20 Democrats signed on. Yesterday, House and Senate leaders said they would be making a local aid announcement of their own. Never did I think I would have to wait 24 hours to read two vague sentences that can be interpreted any number of ways. This announcement does not give cities and towns any better understanding of where they stand. It is particularly disappointing that our cities and towns are bearing the brunt of the poor choices made by the Democratic Leadership. As a former local official, I understand how devastating these cuts are probably going to be. That is why it is imperative to provide information to cities and towns sooner rather than later. It’s too bad only a handful of people are making these decisions behind closed doors instead of in an open and transparent manner. Nearly 25% of this year’s budget has been determined by four people without public debate and without a vote. This is wrong and quite frankly unacceptable. It’s that time of the year again – time to spring forward that is! The Capitol View wanted to take this opportunity to remind you to set your clocks ahead one hour this Saturday night before you go to bed! If you don’t, just remember that when you wake up Sunday morning, it’s actually an hour later! The Department of Fire Services is also asking that you change your batteries in your smoke and carbon monoxide alarms this weekend as well. The DFS says a working smoke alarm can double a family’s chance of surviving a fire. Last week, the Republican Caucus announced its plan to offer a local aid resolution during the House’s next formal session that would establish a minimum level of local aid equal to the amount proposed by the Governor. Since that announcement, close to twenty Democrats have signed onto the resolution and dozens of local officials and the Massachusetts Municipal Association have shown support for the contents of the resolution. However, since then, the Democratic Leadership announced to its members that they should anticipate a 5% cut to local aid. While we hear at The Capitol View think cities and towns have suffered enough, the Democratic Leadership apparently disagrees. In either case, our local communities deserve to know what to expect for budgeting purposes sooner rather than later. Given this development, it’s more important than ever that we get a resolution adopted. Call your State Representative today and urge him or her to sign on! Representative George Peterson: "The Larger Problem in the House"
Last week as I drank my morning cup of coffee and flipped through my Wednesday edition of the Worcester Telegram and Gazette I couldn’t help but do a double-take at the day’s As I See It column titled “Time for State to Clean House.” I checked the date to see if it was April 1st, but nope…it was March 3rd. I make the April Fool’s Day reference because the two authors of this particular column are two Democrats in the House, one of whom voted to re-elect Sal DiMasi to his speakership last year and the other who has had no problem with Democratic Leadership until recently. So naturally, I thought the two representatives must have been joking! The January election of Scott Brown to the U.S. Senate has had an interesting effect on Massachusetts politics. For one, suddenly being a reformer is the cool and hip thing. Take Representatives Tom Stanley and Matt Patrick for example, the two authors of the piece I reference above. In the past, they’ve had no problem going along with the status quo. Often times, they vote with Democratic Leadership. Not necessarily because they agree, but because that’s what they’re told to do. Checking the calendar again, one would notice it’s an election year and because the wave of change is poised to take out quite a few Democrats this year, a handful of them including Stanley and Patrick have jumped on the reform train. With all due respect, these members are a little late to the party. While proposing a few rules changes looks good on a press release or in a guest column, there is an even larger problem in the House of Representatives and in Massachusetts government in general and that is the overwhelming Democratic control. Lord John Acton once said, “Power tends to corrupt, and absolute power corrupts absolutely.” If Massachusetts doesn’t confirm this theory, I don’t know what does. The Democratic Majority, including Representatives Stanley and Patrick have no one to blame but themselves for the corruption and abuse of power we have seen in the Massachusetts House of Representatives. They have allowed this to happen by relinquishing their power and control to the office of the speaker. If this contingent of Democrats is so worried about transparency and good government, they should have supported similar ideas the Republican Caucus has offered numerous times over the years which have been traditionally and almost exclusively defeated on party line votes. Representatives Stanley and Patrick have had no problem in the past defeating good government policy proposals and while they continue to fudge their records it’s important to note that roll calls don’t lie. Interestingly enough, these two members have voted in favor of the rules offered to govern the House under former Speaker Sal DiMasi and current Speaker Bob DeLeo. These votes would indicate that “The Larger Problem in the Massachusetts House” is the one-party control in the legislature - the cure for which lies at the ballot box. Governor Deval Patrick must have read the results of the latest Rasmussen poll because earlier today outside of a crowded hearing room, the Governor went on the attack and his target was his gubernatorial opponent, whose poll numbers are climbing! In case you missed it, a new Rasmussen poll shows Republican Charlie Baker inching closer to Deval Patrick, whose poll numbers are anemic . As reported by State House News Service, “Patrick still leads the field, garnering 35 percent among a survey of 500 likely voters, but Baker has moved closer, scoring 32 percent, while Cahill has fallen to 19 percent.” Those are not the kind of numbers a sitting Governor wants to be seeing 8 months out of an election. As you know, Governor Patrick’s marionette Lieutenant Governor Tim Murray does most of the bomb throwing when it comes to campaigning. However, the Governor got in on the action today after testifying at a hearing. 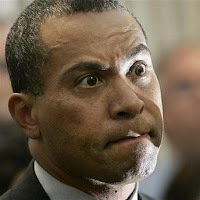 When Governor Patrick left the hearing room, he was swarmed by reporters and the Governor, joined by campaign staff, wasted no time providing the press with what appeared to be his “Rasmussen Response.” Since his poll numbers are in the toilet, who can blame the guy for attacking his very qualified opponent? Talking about his Republican rival, Governor Patrick told SHNS, "While we've been dealing with this crisis, at least one of the candidates in this race has been in the middle of this industry and hasn't offered any solutions yet. I'd be interested to hear what he has to say." Have you noticed that every time Lieutenant Governor speaks, Governor Patrick’s poll numbers go down? Maybe that’s why the Governor gave Tim the day off! As you may have heard, Charley Manning recently took over the 12-3pm time slot at WRKO and his inaugral show was on Monday. House Minority Leader Brad Jones joined Charley yesterday for the 1 o'clock hour and the two talked about a number of hot topics. Click here to hear the full segment between Representative Jones and Charley. Governor Patrick can’t even run his own office efficiently! In case you missed it, today’s Boston Herald has a report that calls into question Governor Patrick’s ability to run his own office, let alone the Commonwealth of Massachusetts. One of those former staffers is none other than Doug Rubin, who now runs the Governor’s re-election campaign. Rubin alone received more than $11,000 in vacation pay when departing from the corner office. When asked to comment on this story Governor Patrick said, “I’ll have to look at it.” Is this the leadership we’re supposed to believe in? Governor Patrick needs to get his own house in order first. If he proves he is capable of doing that, maybe then he can take a look at policies in other state agencies and quasi-agencies. Until then, Governor Patrick probably shouldn’t comment on any other obscene payout scenarios since his office is very guilty of that practice. 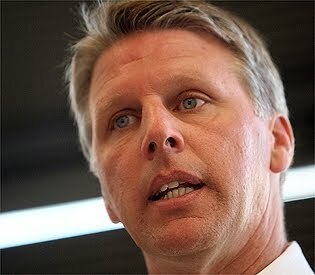 What’s particularly ironic about this story coming to light today is the fact that Lieutenant Governor Murray was quoted in an Associated Press article just today saying his republican opponent “is misleading the public by suggesting state employees haven't suffered like their private sector counterparts amid the economic downturn.” Murray, a.k.a. the Governor’s sidekick, went on to say "It's bad enough to try to score cheap political points on the backs of public employees, but he's wrong. He's flat-out wrong.” We guess the Lieutenant Governor should do a little research before he opens his mouth since obviously if you’re a friend of the Patrick-Murray Administration, these perks are common practice! In case you needed another reason to question state government, click here to read a Boston Herald report that is sure to make your blood boil! The report goes on to say that three civil engineers working with DCR made more than $100,000 each in overtime alone last year! If that’s not exorbitant, we don’t know what is! While there are a wide array of views about the stimulus bill it is clear that this is yet another example where the Patrick-Murray Administration could and should have used the money better – but hey management is not one of their strong suits. The goal was to create new jobs…apparently they did not get the memo! It seems they thought that stimulus money should be used to pay their friends a little more. What’s particularly annoying is the fact that Wendy Fox, the spokesman for DCR actually has the audacity to defend the overtime perks! She told the Herald, “The civil engineers were kept on the job to help fix the crumbling Longfellow Bridge and other structures.” How she can try to convince us this is a good practice is laughable when there are hundreds of other people that could have helped. Fox goes onto to pull a play from the Tim Murray playbook, playing fast and loose with the facts, saying, “The accelerated bridge program created 800 jobs, not just providing overtime for three guys.” We’d love to see the spreadsheet that details where these 800 jobs were created. BOSTON—House Republicans today announced their intention to offer a Local Aid Resolution during the House’s next full formal session and hope their effort will garner bipartisan support. House Republicans have been on the front lines protecting local aid for many years and say it is time Governor Patrick and the Democratic-controlled legislature respect the state’s cities and towns and stop using taxpayer money as their own personal piggy bank. In case you missed it, recently the White House said to expect poor job numbers and in part blamed the unemployment spike on the heavy snow wreaking havoc all over the country. If that’s not spin, we don’t know what is! Today, the state’s Executive Office of Labor and Workforce Development reported that Massachusetts unemployment increased to 9.5%. While they’re not blaming inclement weather, the office says the Commonwealth reported a net gain of 400 jobs. That’s fine and dandy, but the fact of the matter is under the Patrick-Murray Administration, thousands of people have lost their jobs. Though some of the job loss can be blamed on the poor global economy, Governor Patrick and Lieutenant Governor Murray have done nothing positive to help create and retain jobs here in Massachusetts. We know the Patrick-Murray Administration likes to be fast and loose with facts but there’s no hiding the fact that since they took office more than 105,000 jobs have been lost. The Executive Office of Labor and Workforce Development also reported today that close to 330,000 people are unemployed as of today. That number doesn’t even include those workers who are considered under-employed or those who have exhausted their unemployment benefits. Governor Patrick needs to stop spending his time raising money in New York and spend a little more time here working to put people back to work. After all, the voters of Massachusetts didn’t elect him to hobnob with New York’s richest, they elected him to govern the Commonwealth of Massachusetts. BOSTON—House Minority Leader Bradley H. Jones, Jr. issued the following statement today after the House engrossed An Act Providing for the Financial Stability of the City of Lawrence. Once again the Democratic leadership has outdone itself. I would have expected the political maneuver that stifled debate in the House Chamber under the former Speaker. I offered this amendment today because I genuinely believe it would have provided the best opportunity for the City of Lawrence to regain financial solvency by balancing tough state intervention and assistance while respecting local sovereignty. The option laid out by the House Ways and Means Committee doesn’t go far enough. At some point the Democratic leadership on Beacon Hill needs to recognize that the people of the Commonwealth are interested in long term reforms and solutions, not short term fixes. As the Massachusetts House of Representatives prepares for a spirited debate on how to best assist the City of Lawrence regain financial stability, House Republicans are offering an amendment that they believe is the best approach for the city to achieve success. 1. Maintains the borrowing provisions provided for in the current bill in order to allow the city to correct their fiscal shortfall. 2. Immediately establishes a Finance Control Board to oversee the city’s finances for at least the next 3 fiscal years. a. The Control Board will be composed of 5 members: 3 appointed by the majority vote of the Governor, the Attorney General, and the Auditor, 1 of whom must be a resident of Lawrence; the Mayor of Lawrence; and the President of the City Council. b. The Board will have the power to change city departmental budgets, implement cost saving measures they deem appropriate, including joining the GIC, and changing fees and rates in the city, etc. 3. Incorporates receivership as a last resort, if the finance control board determines by majority vote that their powers are insufficient to correct the finances of the city. 4. Maintains the process by which an Officer within the city’s department of budget and finance will be appointed, and the officer’s term will continue to extend until all debt has been repaid. Republican lawmakers believe this amendment provides the best opportunity for the City of Lawrence to regain and maintain financial solvency by balancing tough state intervention and assistance while respecting local sovereignty. The Capitol View will let you know the results of this floor debate as soon as possible. 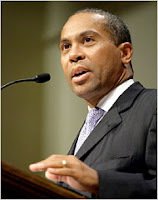 Governor Patrick rescinds RMV fee but will voters rescind Governor Patrick? After a flurry of public backlash, Governor Patrick apparently realized today that raising yet another fee in this poor economy isn’t exactly the most popular idea! As The Capitol View reported yesterday, the Patrick-Murray Administration put into place a new $5 fee at the RMV for those customers utilizing branch services in person. Obviously, the general public was furious and now 24 hours into the Governor’s latest public relations debacle, Governor Patrick has decided to rescind the new fee. While we appreciate Governor Patrick catching up to the rest of us, if he is expecting a pat on the back or a round of applause, he’s sadly mistaken. The mere attempt at raising another fee is yet another indicator that Governor Patrick and Lieutenant Governor Murray are so out of a touch that one would think they’re living under a rock. Let’s not forget that it was this administration that only earlier this year was proposing a candy and soda tax. It was also Governor Patrick and Lieutenant Governor Murray who raised the sales tax last year and a slew of other taxes. Governor Patrick made the right decision this time by rescinding this fee. Will the voters make the right decision come November and rescind Governor Patrick? That’s certainly something for the Patrick-Murray Administration to ponder! It’s an exciting day for Massachusetts Republicans and those in the general public who are interested in good government. Representative Karyn Polito of Shrewsbury announced today she is running for Treasurer of the Commonwealth. A ten year member of the Massachusetts House of Representatives, Representative Polito has worked tirelessly on behalf of not only the people she represents but of the people of the Commonwealth as a whole. Representative Polito has made it her goal while serving in the House to bring greater transparency and accountability to Beacon Hill. We have no doubt she will bring those same principles to the Treasurer’s office. The Capitol View wishes Representative Polito the best of luck as her campaign takes shape. Governor Patrick: Nickel and Diming the Taxpayers! Governor Deval Patrick is sending mixed messages to the taxpayers/voters of the Commonwealth. One day he’s putting out press releases touting his accomplishments and the next he’s raising or creating new fees! Which is it, Governor Patrick? Are you running for re-election or are you intentionally trying to be a one-term governor? Regardless of your answer, this new fee is only adding insult to injury. In case you missed it, the Boston Herald reported today that “Governor Patrick is quietly whacking beleaguered Bay State motorists with a $5 fee to use Registry of Motor Vehicle branches to renew their licenses and registrations.” So, basically you have to pay 5 bucks just to talk to a state employee and oh yeah, your taxes are already paying their salaries! This governor is doing everything he can to nickel and dime the taxpayers. In addition to the slew of new and increased taxes since taking office, now Governor Patrick wants you to pay an additional $5 just to utilize the RMV! What’s next? Is the Governor going to charge men and women to use the bathroom at state facilities? It really is getting absurd and insulting to watch Governor Patrick drain the wallets and pockets of taxpayers all over Massachusetts. Raising fees and increasing taxes in not the answer to our state’s economic challenges. If anything, these higher fees and taxes are making it harder for already struggling taxpayers to continue living in Massachusetts.